Autonomous Robots reports on the theory and applications of robotic systems capable of some degree of self-sufficiency. 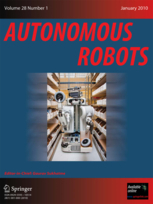 It features papers that include performance data on actual robots in the real world. Coverage includes: control of autonomous robots · real-time vision · autonomous wheeled and tracked vehicles · legged vehicles · computational architectures for autonomous systems · distributed architectures for learning, control and adaptation · studies of autonomous robot systems · sensor fusion · theory of autonomous systems · terrain mapping and recognition · self-calibration and self-repair for robots · self-reproducing intelligent structures · genetic algorithms as models for robot development.